A bizarre new species of tree frog has been discovered in the Foja mountains rainforest on the Indonesian island of New Guinea. 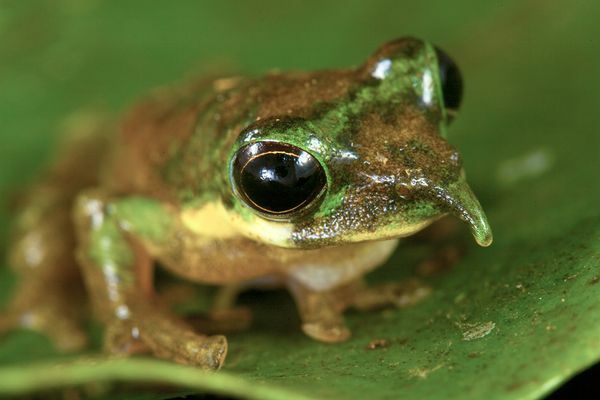 The frog, which has been nicknamed the Pinocchio Frog, has an unusual spiky nose. Amazingly, the frog's "nose" points upwards when the male calls, but deflates and points downwards when he is less active. The frog was first found sitting on a back pack in the researchers campsite. The find is amongst the latest release from a team of scientists from Conservation International and the National Geographic Society which reveals the stunning diversity of flora and fauna of the region. The find includes several more new species including a huge tame woolly rat, a yellow-eyed gargoyle-like gecko and a tiny forest wallaby, the smallest documented member of the kangaroo family. The results of the find will feature in the June edition of the National Geographic magazine but they have a full library of photos from the find on their excellent website. Click here to visit that photo library now or here to read an article from today's Guardian Newspaper about the research. The photo above is from National Geographic. Unreal how many more new species are still being discovered! Really interesting about the tiny wallaby. Might be worth doing a frog entry on the smallest 'roos prior to this which I think are found only on Rottnest Island, Western Australia, several miles out to sea from Perth. Yours in wonder, Swifty the Swifth! It is estimated that nearly 20 million different species exist - of which a little of a million are classified. The diversity of our planet is astonishing! BTW - does the CLOG survive? the Clog seems to survive when i want to leave a comment on a fellow blogger site & am logged into my google account...I think we're witnessing a resurrection! Fair balls - I've been missing my daily dose of classical magic! I think it looks more like Gonzo than Pinocchio? Pinocchio frog, eh? How do we know they aren't lying? I should have showed you the before and after picture! He tried to convince the team he was a toad! Bare faced lies!